Call for Help: Where is Miss Sherlock? Eppu’s post about a new mystery series that transposes the characters of Holmes and Watson to modern-day Japan and makes them both young women for good measure. Unfortunately, we’re still not sure where or how we can watch it, but it’s nice that so many other people are also excited by the idea. Arisia: A Point of No Return for Us Our statement in support of Crystal Huff and against the repeated failure of the Boston-based Arisia convention to effectively address problems of sexual harassment and stalking not just at the con but by members of the con staff itself. Quotes: Finland is Weird. Finland is Different All together now, Finland fans! A gratifyingly bewildered quote from Adrian Tchaikovsky’s Ironclads. “At Least It Made You Feel Something” Erik’s rant against creators who justify storytelling choices that aggravate fans by patting themselves on the back for making us feel something. 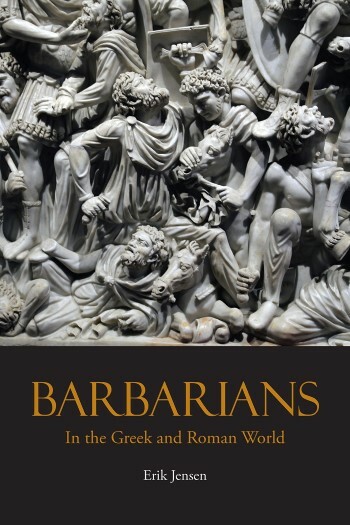 Barbarians in the Greek and Roman World Preview A preview of Erik’s book, published in September, about the concept of the barbarian and the realities of cross-cultural interactions in the ancient Mediterranean. Do-It-Yourself Fantasy Place Name Generator Erik’s name-generating technique from back in 2015 still gets a lot of attention. Apparently a lot of you out there are making up names for things! Sean Bean on the LotR Joke in The Martian Eppu’s 2015 post on Finland’s Yle News interview with the delightful Sean Bean on the Lord of the Rings joke in The Martian. Such a treat, and still well worth watching today. Hogwarts Dueling Club Tablecloth Transformed into Wall Hanging Eppu’s post about a home-made version of the moon-phase dueling cloth from Harry Potter, posted in 2016. Custom is King Erik’s translation of a favorite passage from Herodotus’ Histories, posted in 2017. Thanks for hanging out with us this year. We hope you’ll join us again in 2019.